Axodendritic: Synapse between axon of presynaptic and dendron of postsynaptic neuron. Axosomatic: Synapse between axon of presynaptic and cell body or soma of postsynaptic neuron. Axoaxonic: It is considered as a lateral synapse. In this type, axon of lateral neuron form synaptic connection with axon of another neuron which is lying in the regular neuronal chain. Besides the above mentioned commoner types of synapses, other types are somatodendritic, somatosomatic and dendrodendritic. Presynaptic membrane of axon of proximal neuron. 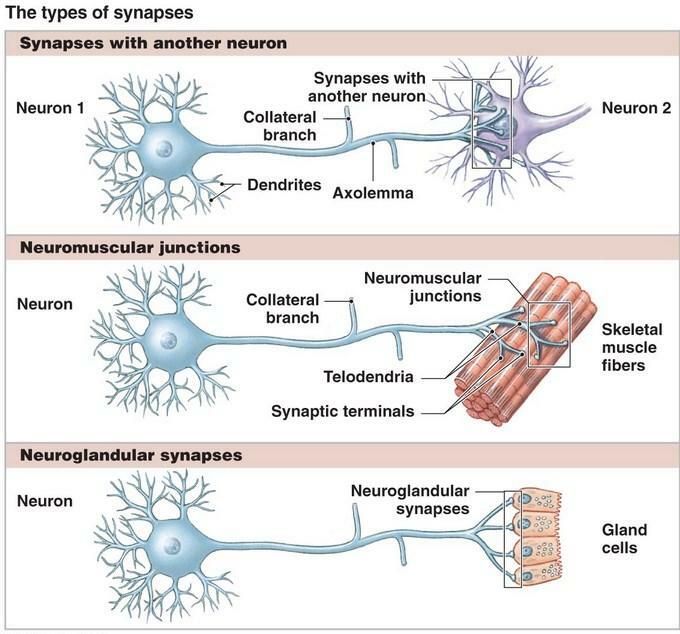 Synaptic cleft between axon and dendrite. Postsynaptic membrane of dendrite of distal neuron. Thickened cell membrane of the axon terminal at the site of synapse is called presynaptic membrane. Beneath this membrane the axoplasm shows some specialized features. The cytoplasm is condensed with presence of number of mitochondria. It also contains many membrane bound vesicles which contain chemical substances known as neurotransmitter. The vesicles are very tiny, 40–50 nm (nanometer) in diameter. One mm (micrometer) is 1/1000 of a millimeter and one nm (nanometer) is 1/1000 of a mm (micrometer). During transmission of nerve impulse, neurotransmitter is released from presynaptic vesicles into synaptic cleft by exocytosis to stimulate postsynaptic membrane of the distal neuron. It is the gap measuring 20–30 nm between pre and postsynaptic membranes. It contains interstitial fluid rich in polysaccharides. Through the process of exocytosis neurotransmitters are released across the presynaptic membrane into synaptic cleft. This is the thickened plasma membrane of dendrite spine at the site of synapse. This membrane shows specialization known as receptors which are to uptake neurotransmitters passing across the synaptic cleft. The dense cytoplasm beneath postsynaptic membrane is segmented and known as synaptic web which contains a network of filame-ntous structure.Impulse Transmitted Across the Synapse Nerve impulse transmitted through presynaptic neuron causes release of neurotransmitter from presynaptic vesicles. Neurotransmitter passing across the synaptic cleft act as chemical impulse to stimulate receptors of postsynaptics membrane. Chemical impulse reaching synaptic web beneath postsynaptic membrane is again converted into nerve impulse to stimulate postsynaptic neuron. There are varieties of chemical substances acting as neurotransmitter. Mostly found neurotransmitters are Acetylcholine and Norepinephrine. Acetylcholine is liberated as neurotransmitter in many synapses of central and peripheral nervous system including those of parasympathetic nervous system. Norepinephrine is released in most of the synapses of sympathetic nervous system. Glycine is the neurotransmitter discharged in the synapses of spinal cord. Dopamine is the transmitter found in basal ganglia and substantia nigra. Serotonin and Gumma-amino-butyric acid (GABA) are other examples of commonly known neurotransmitters. Deactivation or cessation of action of neurotransmitters After desired effect, influence of neurotransmitters is withdrawn in either of two different ways. In case of Acetylcholine, it is broken down by the enzyme Acetylcholinesterase at synaptic cleft. But in case of transmitters like norepinephrine, its effect is restricted by its reuptake back through presynaptic membrane. These are the chemical substances which enhance, prolong, restrict or inhibit the effect of the neurotransmitter on postsynaptic membrane. They are stored in separate presynaptic vesicles.